LONDON--(BUSINESS WIRE)--Technavio’s latest report on the global aircraft vertical stabilizers market provides an analysis of the most important trends expected to impact the market outlook from 2017-2021. Technavio defines an emerging trend as a factor that has the potential to significantly impact the market and contribute to its growth or decline. “With the advent of fly-by-wire technology, the aircraft flight control has been automated. This technology allows a pilot's commands to be transmitted electronically. This system has significantly reduced aircraft weight and complexity of aircraft manual controls, reflecting in a better fuel efficiency,” says Avimanyu. Become a Technavio Insights member and access all three of these reports for a fraction of their original cost. As a Technavio Insights member, you will have immediate access to new reports as they’re published in addition to all 6,000+ existing reports covering segments like aerospace manufacturing, defense, and general aviation. This subscription nets you thousands in savings, while staying connected to Technavio’s constant transforming research library, helping you make informed business decisions more efficiently. 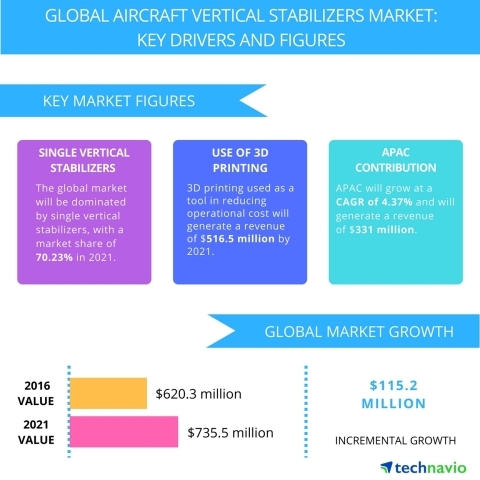 Technavio’s latest report on the global aircraft vertical stabilizers market provides an analysis of the most important trends expected to impact the market outlook from 2017-2021.